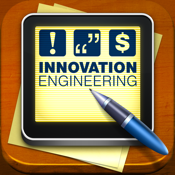 "it's like having an innovation scratch pad in your pocket"
The Yellow Card app from Innovation Engineering helps you quickly capture the most important parts of your innovative idea right at the moment of inspiration. It includes the concept of the idea (who's it for and what problem does it solve? What promise solves that problem and what proof do you have that it will work?). It also includes a section on Project "Death Threats" and how you might resolve them. Also, a Math section where you can outline the potential upside of the idea.